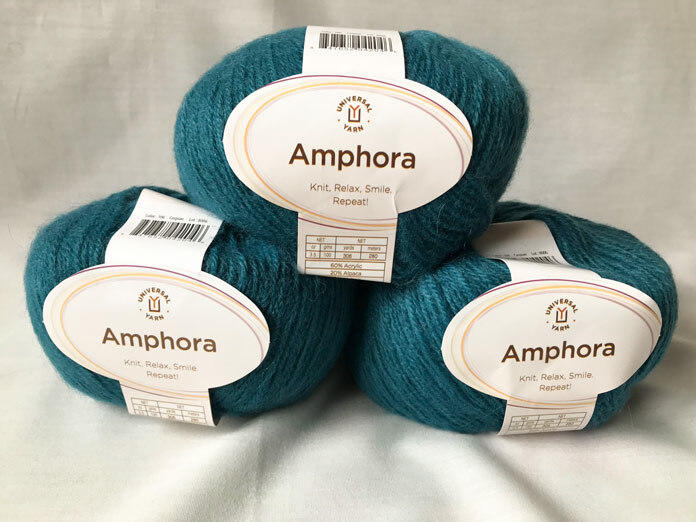 Amphora yarn from Universal Yarn is a deliciously soft and fluffy lightweight yarn. The strands of the yarn are brushed, which makes them perfect for the cold weather. Even with the designation of light weight yarn, the fiber content still packs in the warms. 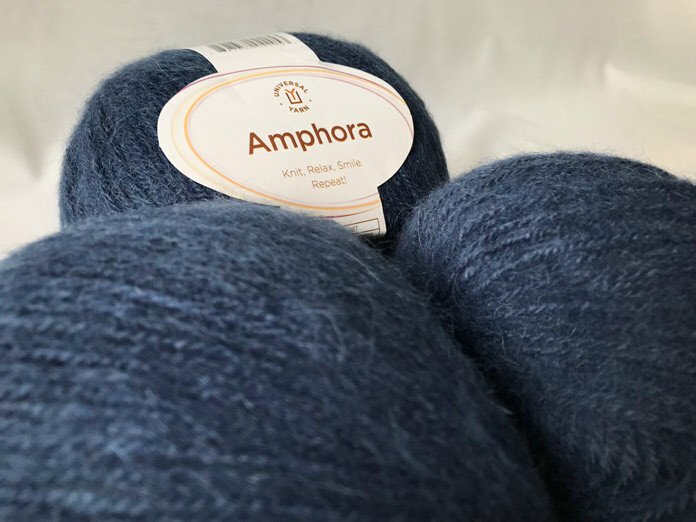 Mohair, alpaca, and acrylic create this delightful yarn that has the softness of natural fibers with the durability of synthetics. My first impression upon opening the box of yarn was one of complete and total glee. Amphora was contained in neat long bags that made it look so completely organized. That would be extra points on my OCD meter. When I reached into the bag to feel the yarn, I was a little surprised. I thought the yarn would be much softer. Don’t get me wrong, the yarn was still soft, but I thought it would’ve been on the level of those cartoon characters who sleep on clouds. That kind of soft. I mentally shrugged and started my swatch on bamboo needles. 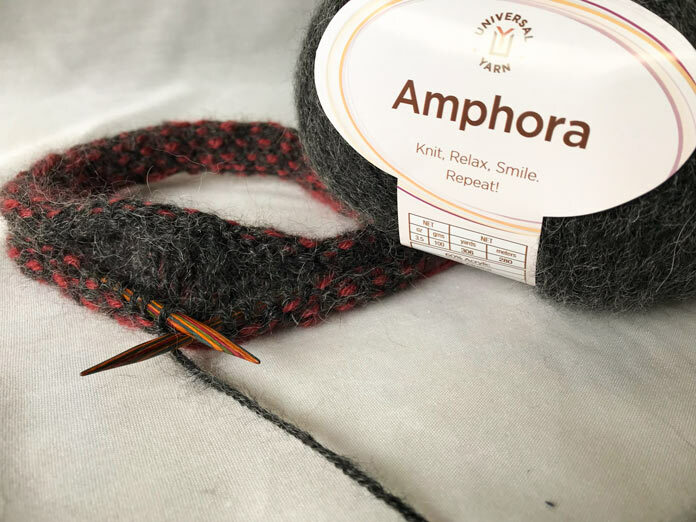 I really loved working with Amphora yarn. Most really soft yarn is so slippery to work with I get really frustrated and feel like I’m forcing the project. When I’m knitting on the couch and bracing my legs on the edge so I don’t lose traction in my knitting, I know it’s going to be a frustrating project. This didn’t happen at all with Amphora yarn! I was able to sit and relax throughout my knitting. Then I started knitting a project that was growing larger and I had to switch to longer circular needles, and I only had them in metal. Everyone has their own needle preference and it can change based on the type of needle. I know for DPNs I prefer metal needles, but my circular needle preference sways towards the natural composites. This is where the slippery, leg bracing knitting happened. I’m not a fan of metal needles to begin with, I prefer the earthy textured feel of a wood or bamboo needle. I think I bought the metal ones with a specific project in mind when the yarn was not sliding nicely along wood needles, so I needed some super slippery needles. I would not suggest knitting Amphora with super smooth metal needles. The bamboo makes it a lot easier on your fingers and wrists. I found my tension immediately got tighter when I switched from bamboo to metal. The color of Amphora yarn pictured here with wood needles is called Ebony. After finishing my project, it was time to block it. 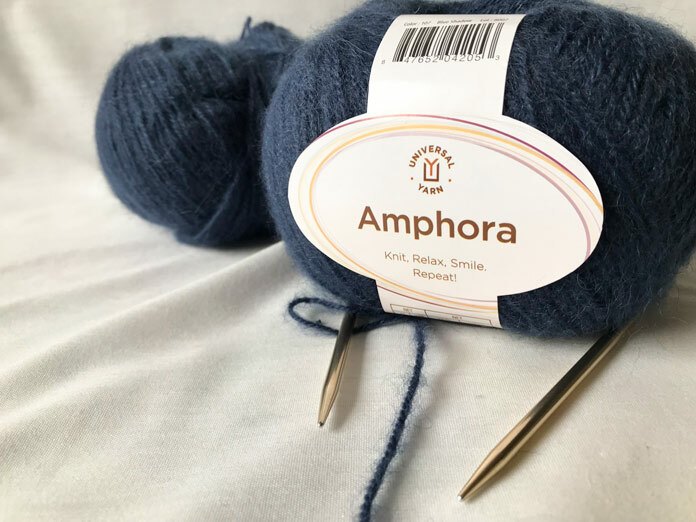 When I first felt Amphora yarn, and it felt slightly more textured than I anticipated, I had the sneaking suspicion that this was not how this yarn would turn out, and I was completely right. After steam blocking my project the yarn got so much softer. Remember those cartoon characters sleeping on clouds I mentioned before? Yeah, they would have woken up screaming in pain from sleeping on the clouds rather than Amphora yarn. Amphora is the buttery texture I was looking for. It’s like fiber made liquid. 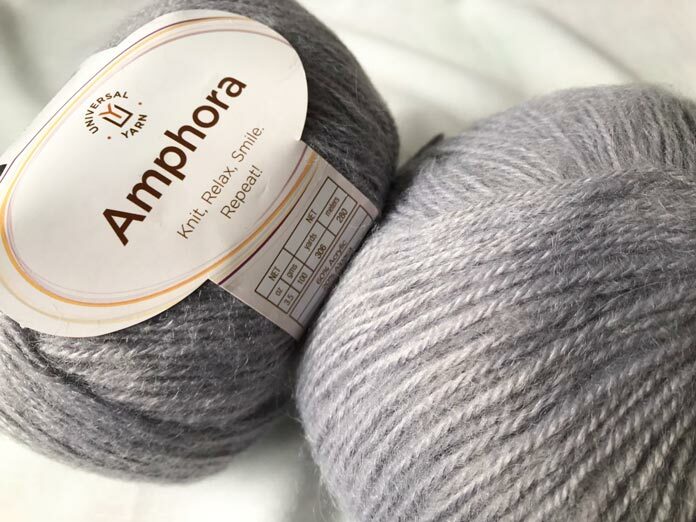 The finer content of Amphora really gives the yarn a beautiful yet subtle sheen. The color Blue Shadow really shows it off well. Overall I think this is the best of both worlds. Amphora is so nice to knit with and once blocked, it is the soft you expect from mohair and alpaca. You get to have this crazy soft yarn without trying to knit some kind of silky Cirque du Soleil fiber. Put simply, it’s perfect.